Scene from 'Chariots of Fire', 1980. Railway Air Services aircraft at Croydon Airport, 1935. Horse-drawn delivery vans, Euston station, London, c 1926. 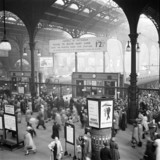 Early morning rush hour at Liverpool Street station, London, 12 October 1951. Royal family tour of South Africa, 1947. Women railway workers obscuring gas lamps, Greater Manchester, May 1917.